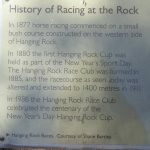 There isn’t really much vintage architecture at Hanging Rock racecourse, but horse racing below the amazing rock formations is a tradition going back over 140 years, so I decided to write about the place anyway after our visit to the New Year’s Day meeting in 2019. 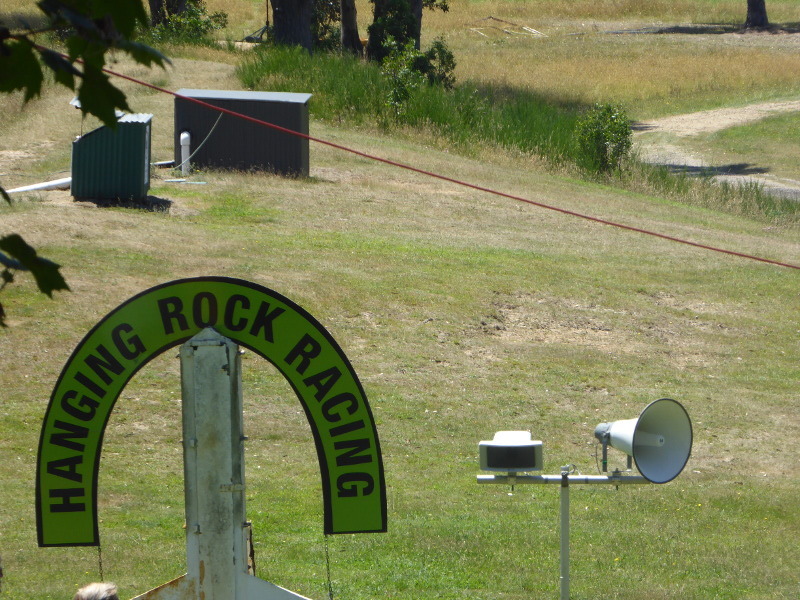 They only race here twice a year, on New Year’s Day and Australia Day so for 11 months of the year the race track must sit silently under the gaze of the extraordinary Hanging Rock. We got to the site two hours early as we wanted to have a stroll up the rock before racing started, but even so we were soon caught up in the long, slow line heading into the car park here (and for people who wanted to visit just the Rock, you’re best avoiding those two race days, as the parking fee goes up and you’ll be caught in the crowds). 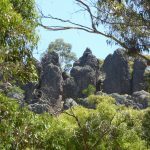 The 1970s film Picnic at Hanging Rock depicted the magical qualities of this place, and I have felt some sort of special vibe each time I have visited (last time was 25 years ago as a backpacker, by the way). This New Year’s Day was no different. 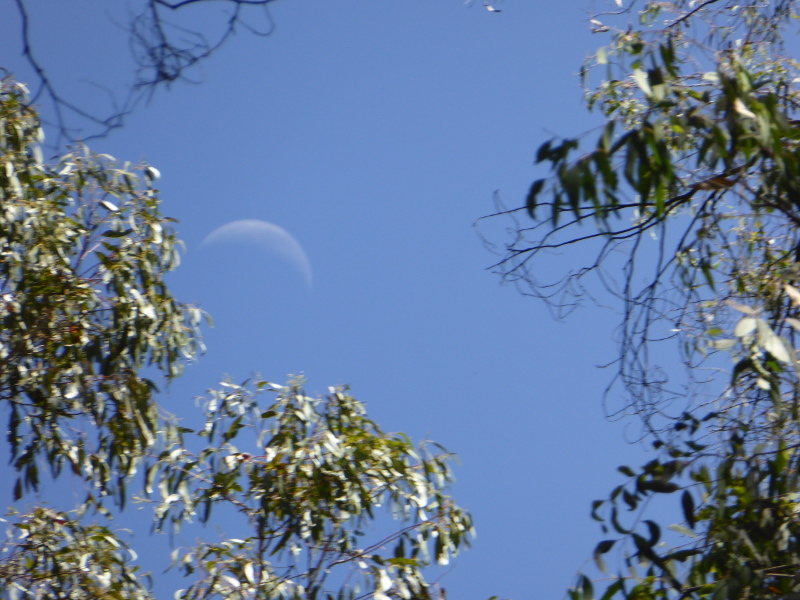 It began with the glimpse of the crescent moon high in the sky among the tall gum trees, but continued to develop as we wound our way round the paths that lead up towards the summit. 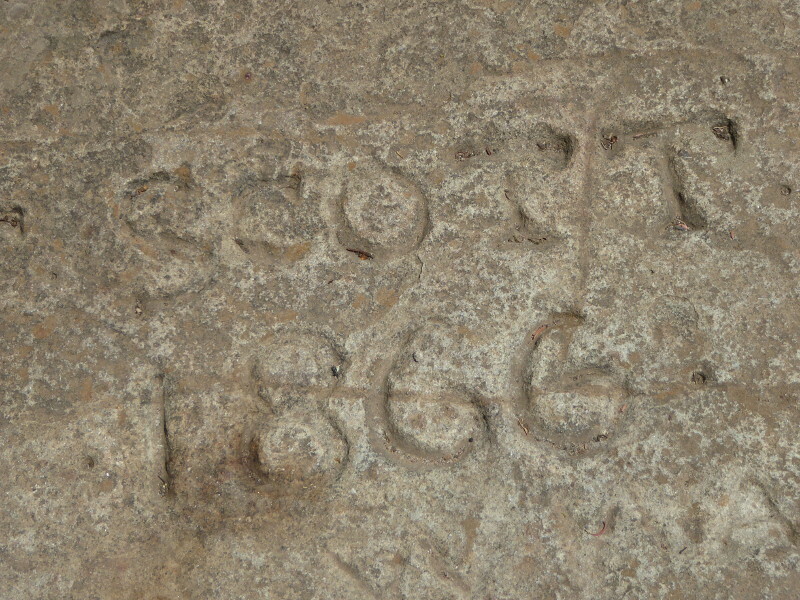 By the time I was staring down at the 1866 graffiti carved into the stone by Mr T. Scott near the summit, I had lost all sense of direction and would have been hard pressed even to point out where the racecourse was behind one of the rocks that then encircled me up there. Back at the racecourse, the crowds had gathered by the time we got back down the mountain, and most of the shady spots had already been taken. 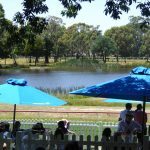 We also realised that most people brought their own picnic chairs and hampers (though no BYO alcohol allowed on the course). This meant we actually didn’t stay too long for the racing itself, and kept moving around to find new vantage points and the best areas to pick up the cool breeze off the lake in the middle of the track. 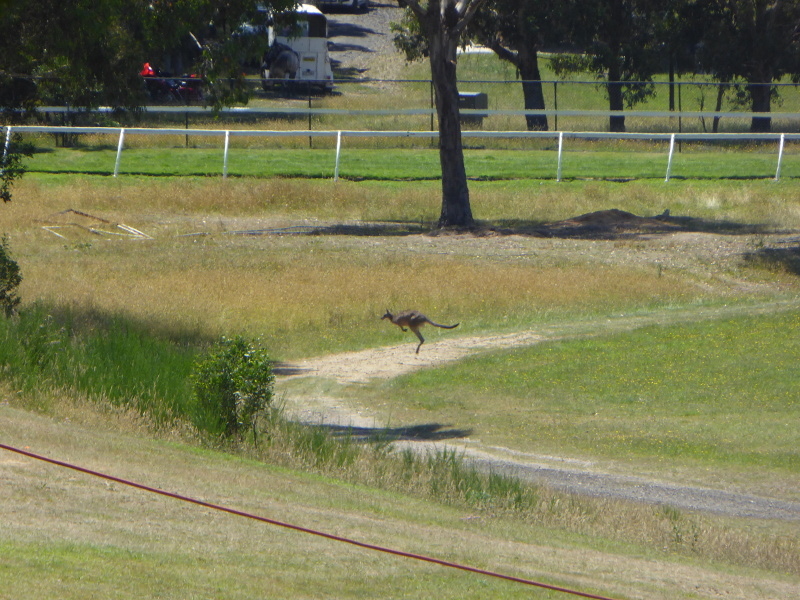 Just before the horses began to line up for the first race, we did spot a kangaroo leaping across the middle of the track, leading to brief hopes that the whole thing might be visited by a proper herd of roos, as happened a few years ago, when the meeting was cancelled! But all was well and racing went ahead as planned. 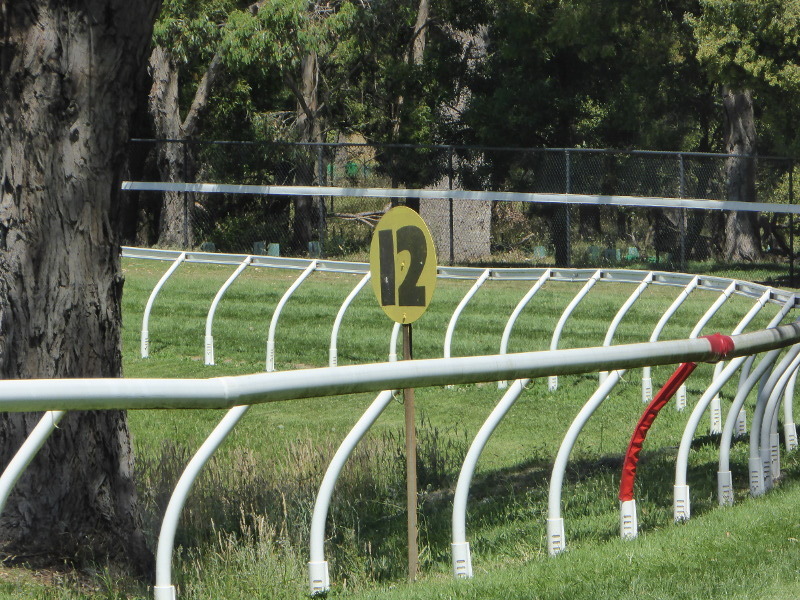 It’s a tight little track, though, with even the 1000m sprint being on a tight bend unlike most racecourses. 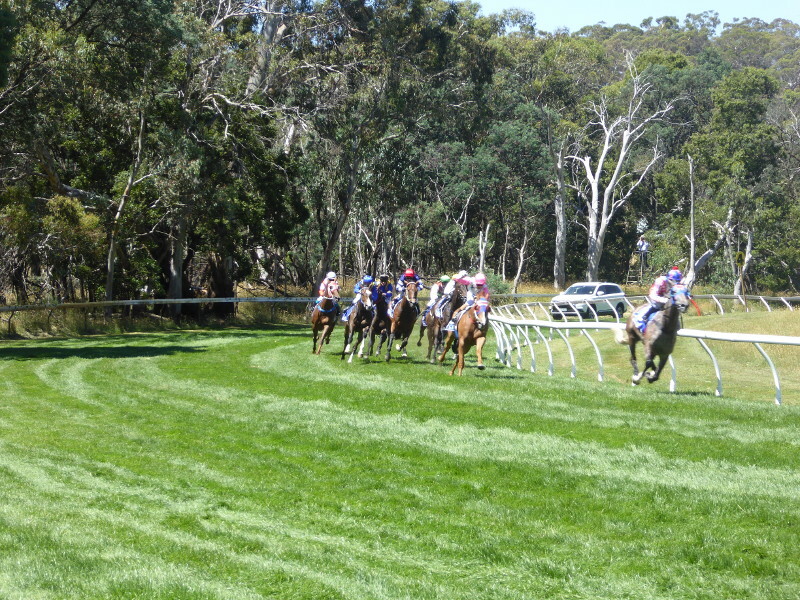 The 1800m start is off on a separate little section tucked away deep in the bush, surrounded by tall gum trees. 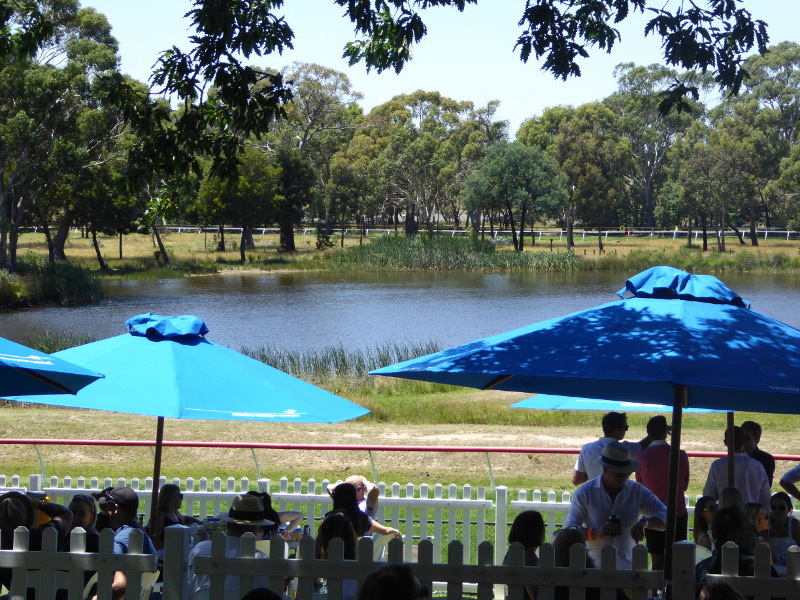 It’s a stunningly beautiful setting, with the Hanging Rock up above and the gum trees all around, with that lake in the middle. I’ve actually never seen a racecourse like it because it is so small and there really is no grandstand or parade ring for the horses. 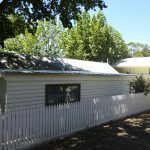 The only vaguely vintage building is the weatherboard admin office, which probably dates from the 1950s (though please correct me if you know better). 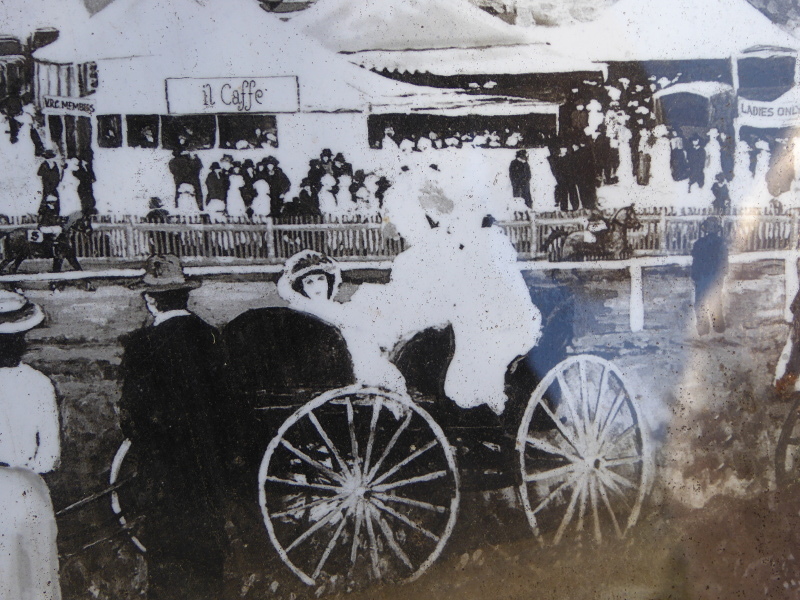 But down by the entrance to the racecourse, there is an information board talking about the days racing started at Hanging Rock in the 19th century, and there is a rather wonderful photo showing people at the races in the days when folk came on their horse and carriage. I noticed they also had a Ladies Section to the track in those days, but that the Italian influence had already begun with Il Caffe van on the trackside. Oh, by the way, we were delighted to see our young friend Billy who serves coffee off the Little Bean caravan doing the same job as Il Caffe had done 100+ years ago, so that’s another tradition that continues into the 21st century. 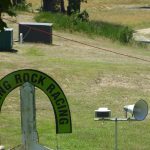 It cost $25 per person to get in to Hanging Rock Races and park your car. 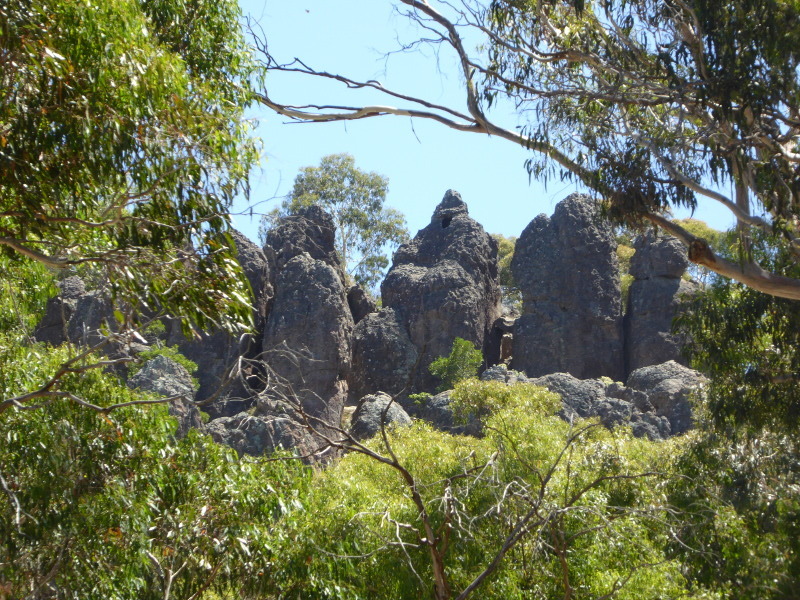 That also gave access to the paths leading up to Hanging Rock itself. Lots of food stalls available on-site as well as good coffee, though most people seemed to come with their own picnic hamper. According to a feature in the Weekly Times newspaper in April 1917, long before horse racing was organised under the Hanging Rock, locals would play Highland sports, do lots of dancing and hold bagpipe competitions at what was already a popular picnic spot, as we know from the feature film set in Edwardian Victoria. 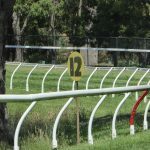 The racing track was then built in the second half of the 19th century, with the first official Hanging Rock Race meeting held in the 1880s (the earliest reference I found on Trove dates from 1884). 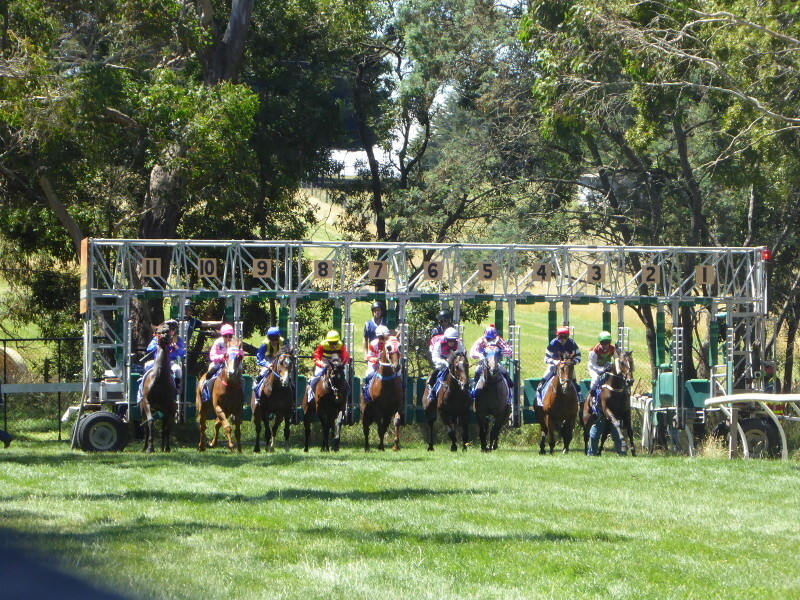 Sporting correspondents suggested sometimes that many people attend the New Year’s Day races here just because they ‘enjoy themselves ruralising pure and simple.” The racing was secondary. 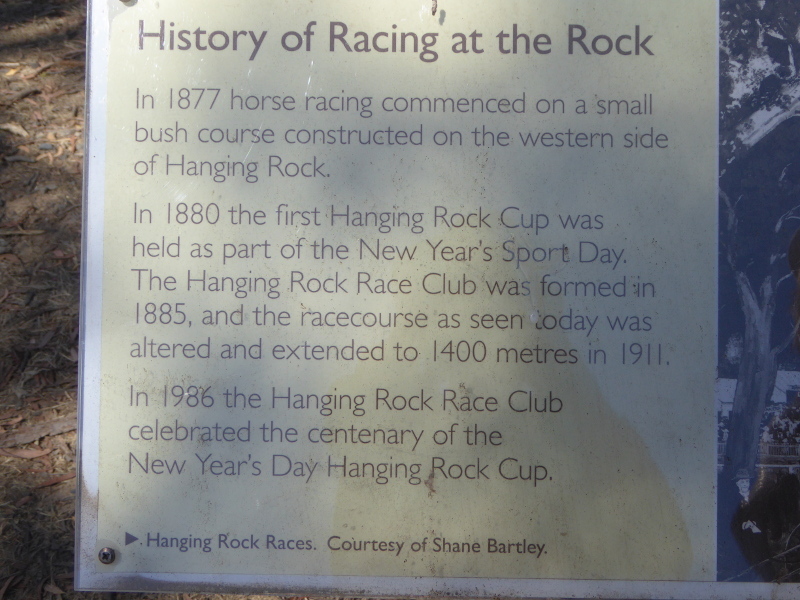 One reporter from the Kyneton Observer in 1890 complained though that the frivolity at Hanging Rock was all very well, but that start times ought more or less to correspond to what was in the race programme, instead of running 30-40 minutes late, he said. 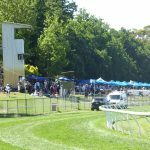 A Mr J C Keating, who aimed to make Hanging Rock Racecourse a ‘young’ or ‘little’ Flemington, took over running the place in 1901, and things got a whole lot more organised from then on. 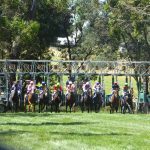 A few years later, in 1925, newspapers described Hanging Rock Races as largely a ‘giant picnic’. In 1924, the crowd was estimated at 20,000, which would have been a record still unsurpassed today. But then it strayed a bit from a 2019 portrait: “Heard on the wireless, cricket scores cheered the Bradman fans…and to those who liked to relax at darts or try their luck at Aunt Sallies, the sideshows gave a hearty welcome.” Ah, Aunt Sallies: when did they stop being an attraction at funfairs? Photos in the papers after the 1951 meeting showed crowds lining the rails right around the bend into the home straight. 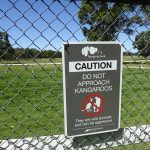 There were just a couple of families picnicking there in 2019. But in a more gender-equality conscious moment, the papers reported on 19 year old Pamela Knox being ‘probably the first woman’ in Victoria to do the race commentary at Hanging Rock in 1948. Apparently the bloke who was booked to do it that day failed to turn up, with Pam on hand to take up the mic. Is Pamela still with us today at the ripe age of 90? Can she remember that big day at the races? In 1956, 17 year old jockey Charlie Hartnup was beaten into second by a nose four times in a row. His Mum fainted from the excitement and had to receive medical care before returning for the fifth race, which Charlie won by 10 lengths. This young lad pulled out the stops for his mother, but then went on to a sparkling career, winning all six races at Avoca and I believe winning 11 races on the trot at one point in his career. Is Charlie still with us today? Must be turning 80 soon, if so. There were UFO sightings during the New Year’s Day meeting in 1954. Lots of reports were called through to air traffic control at Essendon Airport, for what was most likely a meteor hitting the earth’s atmosphere, but the 1950s was a key time for suspicions of UFOs and the Mrs Jerrems who spotted a flying saucer on its side in the sky over Hanging Rock Races may have had a glass too many the night before, I think (The Herald reported this on 6 January 1954). 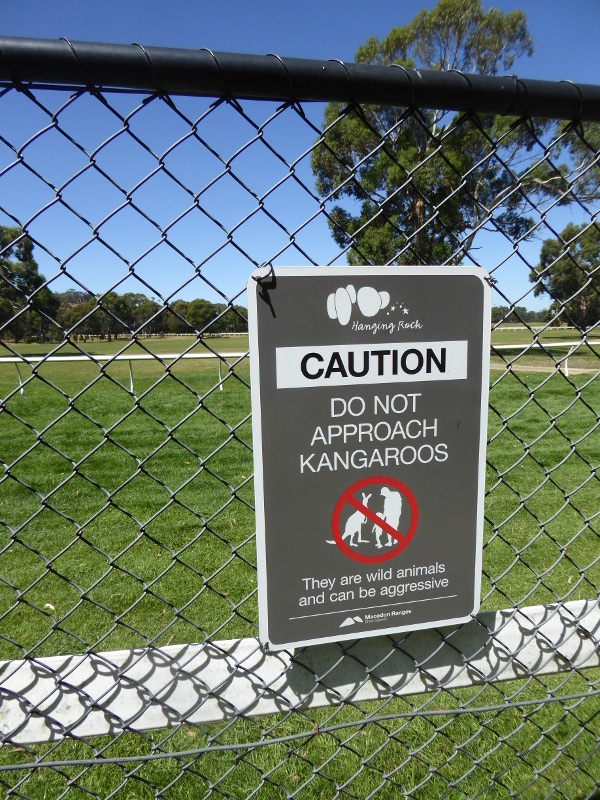 Kangaroos may have stopped racing in 2012, and UFOs came close in 1954, but in 1939 a bushfire in nearby Woodend lasted longer than it might have because so many locals who may have helped firefighters had taken themselves off for a day at the races. What a shock that must have been when they got home. 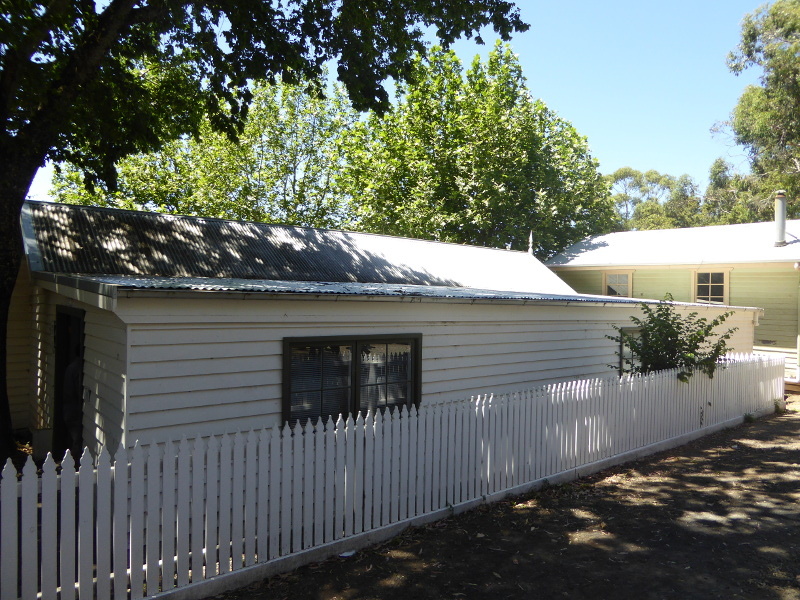 Reports from 1955 talk of a new admin block – that could well be the same building as the weatherboard structure there at the track today, which looks pretty 1950s vintage. Can anyone confirm? I could have picked Pamela Knox for her achievement in becoming the first Victorian woman to do the racetrack commentary in 1949 (she later married a Mr O’Connor so if she is still with us, she will probably be known as Pamela O’Connor). 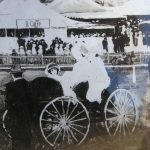 But I rather liked the accounts of Hanging Rock Race Secretary JC (Jack) Keating, who ran the races here from 1901 until close to his death in 1924. 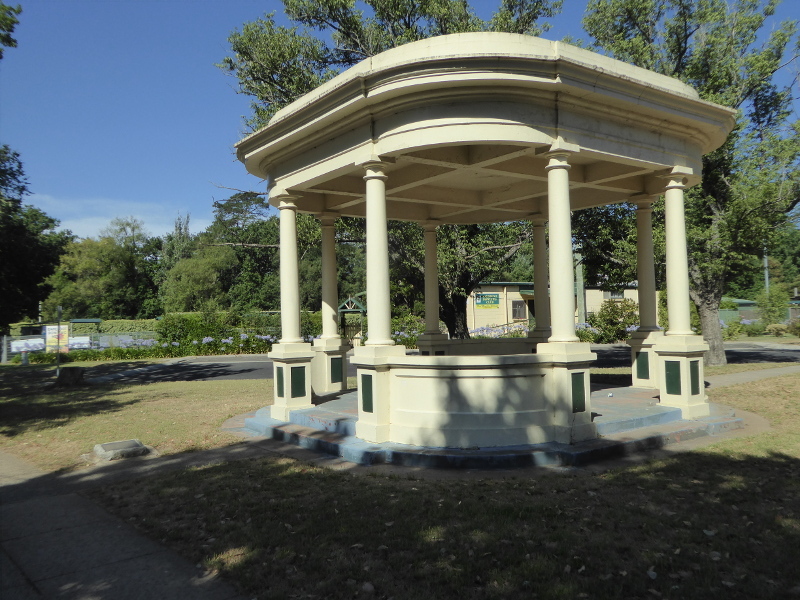 They liked him so much around these parts that there is a bandstand memorial dedicated to him in the centre of Woodend. In a nice touch, during his last days, as he lay in bed just half a mile from the Woodend racecourse he also managed, the local authorities had all the race traffic diverted away from his home so that he wouldn’t be disturbed during his illness. 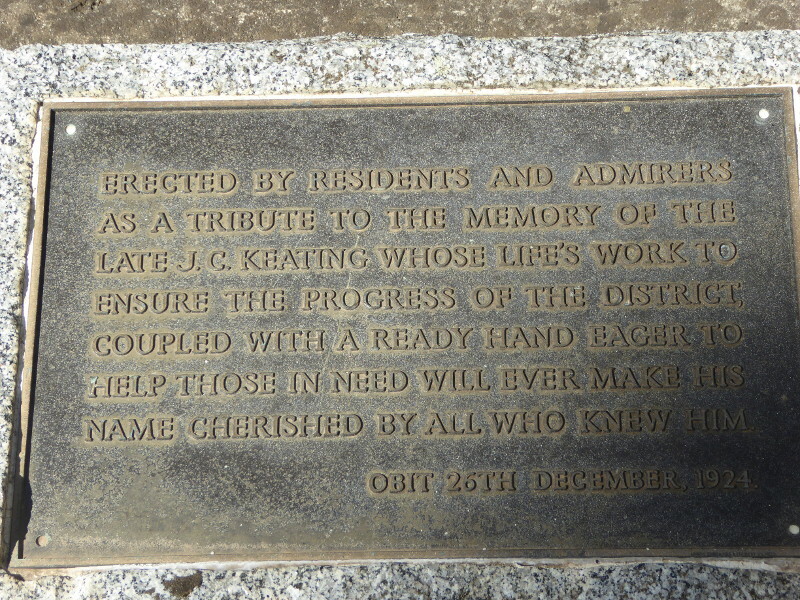 And they even dedicated Woodend bandstand to Jack Keating, so we dropped by to pay our respects one day. 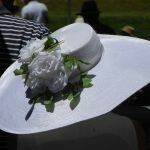 What are your experiences and stories from a day at Hanging Rock Races? 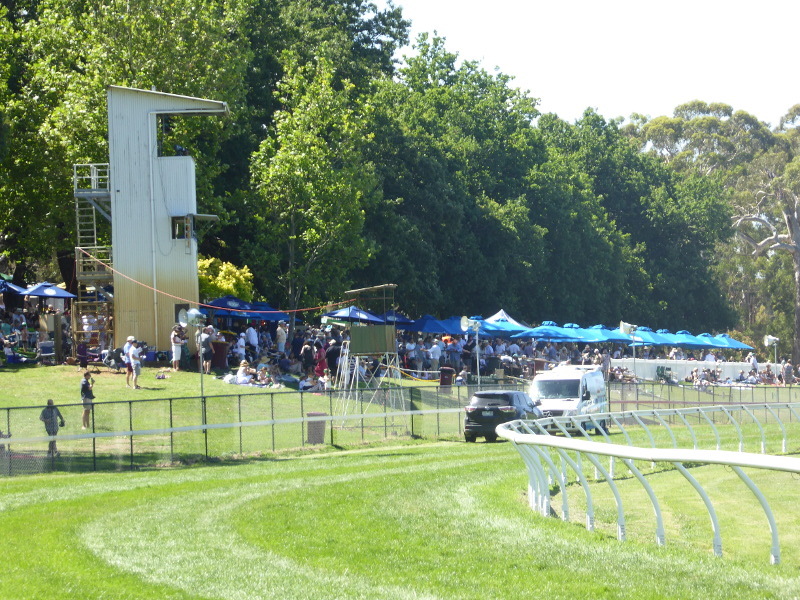 Anybody got nice memories of days out sitting in the shade of the trees at Hanging Rock Races, memories of recent meets or days from decades ago? What was there before the 1950s admin block, anyone know? Any comments or help, just leave them in the box below and we can add them to the post. 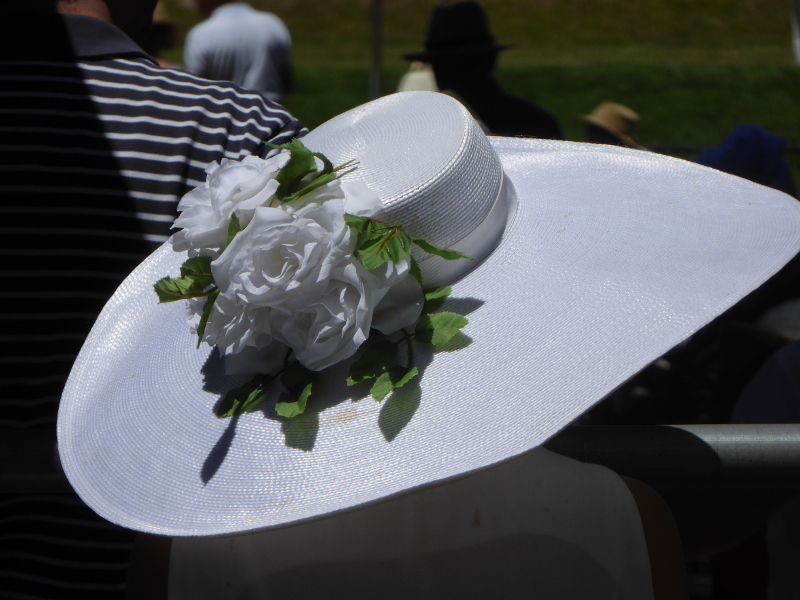 It’s been hard to find any other writings about trips to Hanging Rock Races so if you know of any, please pass on the links. 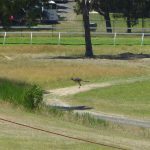 This newspaper article from the Herald-Sun in 2012 mentions the day kangaroos stopped racing, and also the abandonment of racing that year because of the state of the track. Coffee before the off or to drown your losses? In 2019 Billy had the gig serving up great coffee from his caravan called The Little Bean. He kept us going through the afternoon, and had a great spot in the shade.